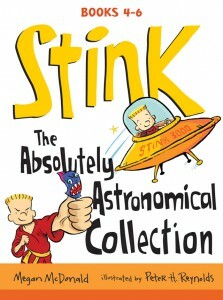 Did you know that Stink's full name is James Edison Moody? Welcome to Stink Moody's very own website! Short is the new tall! Did you know that Stink's name in the Dutch language editions of his books is Rutger? Did you know that glow-in-the-dark ink was used on the hardcover edition of Judy Moody & Stink: The Big Bad Blackout? Did you know that Stink was cast as the planet Pluto in a class play? Give the right-not-wrong answer to a question and you will unlock a treasure trove of stink-y facts and fun. Did you know that some of Judy Moody's nicknames for her brother Sink, include: Stinkbug, Stinkerbell, The Nose, Kimo, James, Dr. Stinkelstein and Shark Hammersmash? In short, he’s smart and thinks knowledge is pretty awesome. 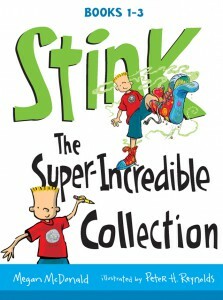 In every book in the Stink series, readers see him questioning, investigating, and discovering the world around him. 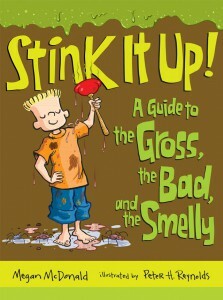 As a result, teachers and parents love sharing Stink books with their own young explorers. ALL-NEW Teachers’ Guides are chock-full of ideas and things you can do with your students in or out of the classroom, all inspired by Stink’s own insatiable curiosity. Megan shares a birthday with a famous princess, a race-car driver, a Rolling Stone, and a racehorse named Smarty Jones — February 28. One summer, Megan and her four sisters tried to  read ALL the kids’ books on the bookmobile. Megan still owns her original mood ring from the 1970s. She keeps it right next to her troll doll collection. Who doesn’t love insects? Megan has written five  books about bugs, one of which is about eating them! Megan’s sister in Minnesota has a mailman named  Jack Frost. No lie! If ever there was a Crazy Socks Club, Megan could  be a member. She has socks with sock monkeys, planets, gnomes, endangered animals, jellyfish, Popsicles, Girl Power, and comics. Ka-Pow! Megan is the proud owner of many Popsicle sticks  with jokes on them, a sugar packet collection featuring U.S. presidents, and what just might be the World’s Biggest Jawbreaker. Her favorite TV show is Jeopardy! Her secret wish  is that someday Judy Moody will be a Jeopardy clue. Guess who used to live near the real Mount  Trashmore? Yours Truly. For real and absolute positive! Megan McDonald is the creator of the popular and award-winning Judy Moody and Stink series. She is also the author of the Sisters Club trilogy, two books about Ant and Honey Bee, and many other books for children. She lives in Sebastopol, California. He has a twin brother, Paul. When their mother found out she was having twins, she laughed so hard that she went into labor early! Paul was born first, fourteen minutes before Peter decided to arrive. He’s part-owner of a children’s book and toy shop called The Blue Bunny, located in the Massachusetts town where he lives. He is vertically challenged (aka, short!). His mother is from England, his father is from Argentina. He made his first animated film while he was in  high school. He’s been creating animation ever since, and even started his own animation company, FableVision. He sometimes paints with tea instead of water – whatever’s handy! He keeps a sketch pad and pen on the nightstand by his bed. That way, if an idea hits him in the middle of the night, he can jot it down immediately. Sometimes, he even draws or writes when he’s half-asleep! One of his favorite books growing up was The Tall Book of Make-Believe by Jane Werner, illustrated by Garth Williams, the same man who illustrated Charlotte’s Web and Stuart Little by E.B. White, and many of Margaret Wise Brown’s picture books. And the Number One thing you never knew about Peter H. Reynolds is: He shares a birthday with James Madison, Stink's favorite U.S. president.